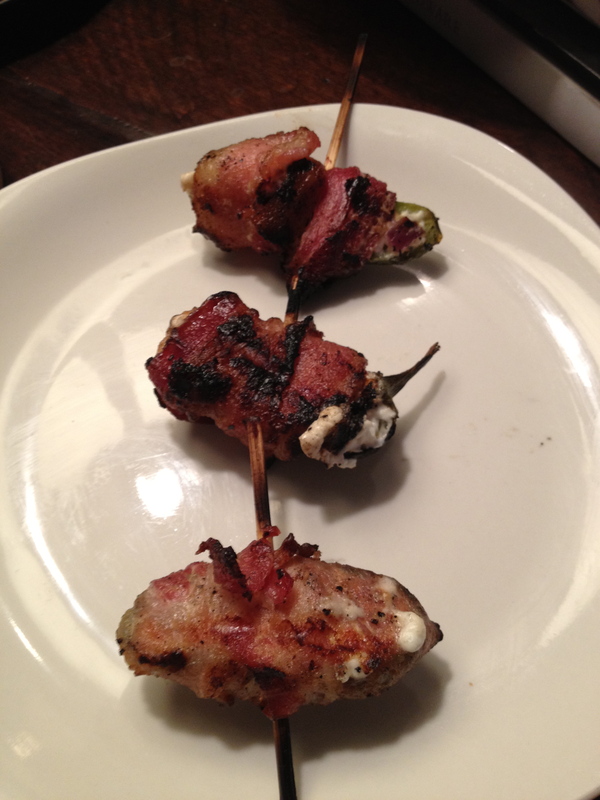 Recipe: Bacon-Wrapped Jalapeño Poppers (The Easy Way) | mrs. and the misc. My husband’s cousin, Amanda recently started this cute cooking blog to showcase some amazing recipes she’s trying and probably coming up with on her own. The food looks and sounds incredible. In fact, it was one post of hers, “Touchdown Jalapeños,” that inspired this one. The thing is, however, Amanda clearly loves to cook from scratch for the most part, and well, I don’t. It’s too much effort. So, inspired by her post, I decided to whip up some stuffed jalapeño poppers like hers, but with my own easy-way-out spin. Slice the peppers lengthwise in half. Clean out the core and de-seed each popper. 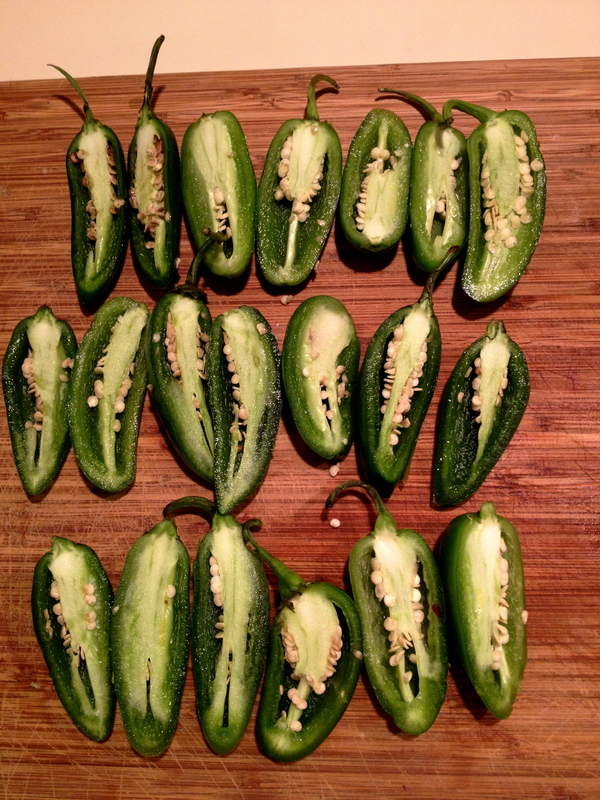 The seeds make the poppers extremely spicy. They’re already going to be spicy, so rinse them all away. Pat dry. 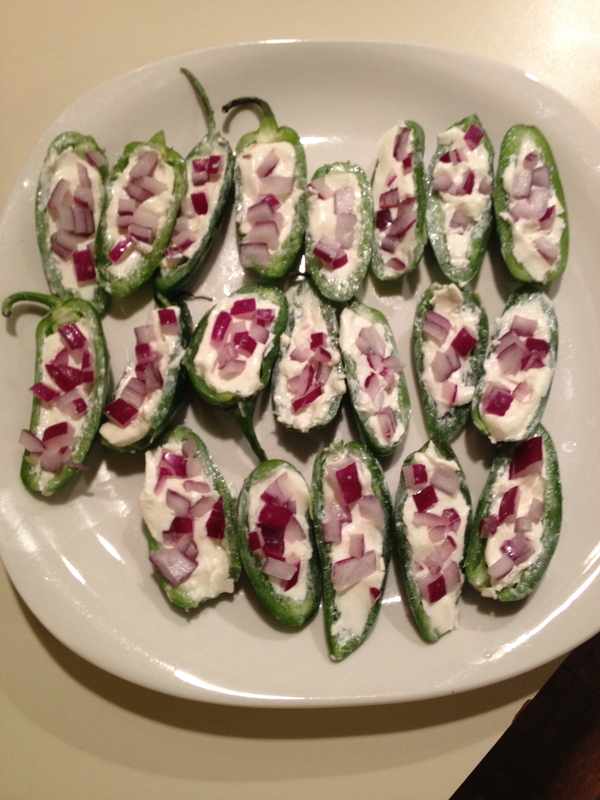 Stuff the poppers with cream cheese. Sprinkle with red onion. Press onions down into the cream cheese lightly to help them stay put. Cut the bacon slices in half. 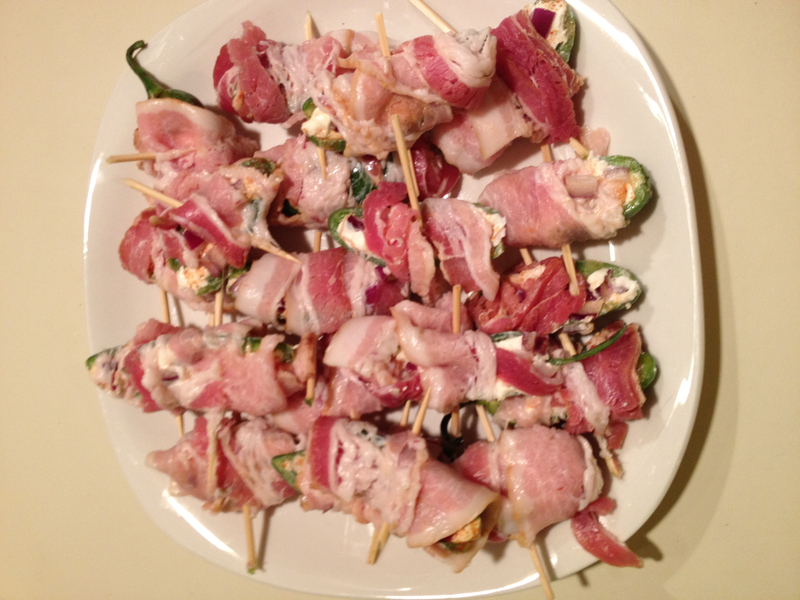 Then wrap one 1/2 slice around each popper and use toothpicks to hold it in place for grilling. Now, they’re ready to grill! Throw them on and monitor their skin and the bacon. IMPORTANT: You want to make sure you cook the bacon throughout. Also, the longer they cook, the less heat the peppers have when you eat them. 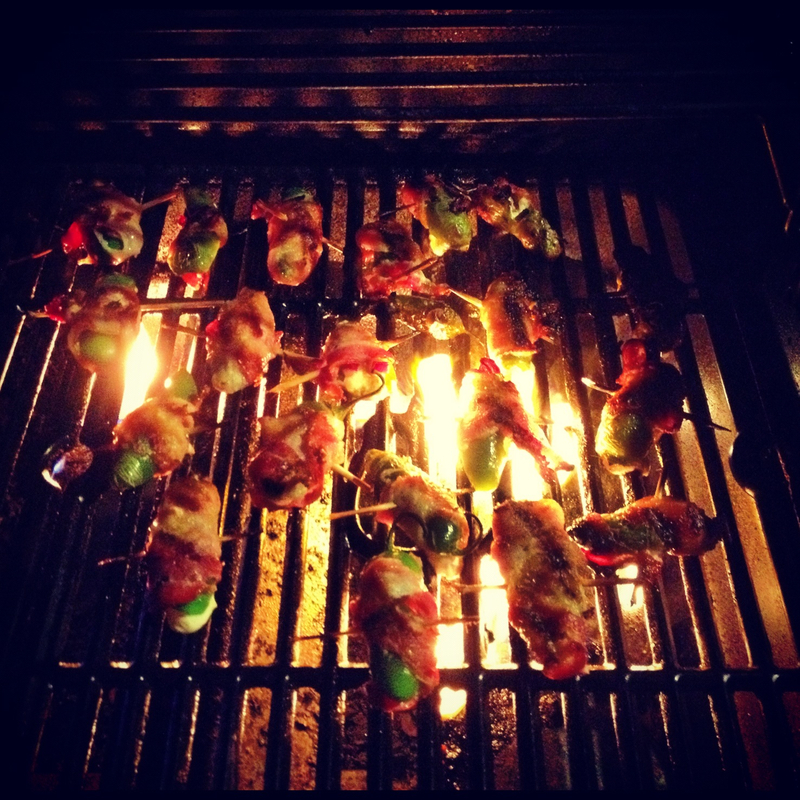 I like ’em spicy – must be the Texas girl in me – but I also always recommend a little char for that good grilled taste. Trust me when I tell you … these are so delicious. The cream cheese, bacon and red onion are just perfect with the spicy, juicy freshly grilled jalapeño! I might be breaking culinary rules but, hey, you can’t argue with EASY. Grilled bacon is a winner in our house in any form, but it’s good to know that the longer you cook the peppers, the less heat they keep. I’m a spice wimp, so I’ll keep me on there for a long time! Thanks for sharing the recipe! You’re so welcome! It’s sooooo yummy! If you make sure all the seeds are gone and the pepper is cooked till its softer rather than crisper you won’t have any spice issues whatsoever! Enjoy!